The days are now consistently sunny, hot and dry. Changes are happening in the observable flora and fauna. Butterfly numbers are increasing in terms of both the number of species and the number of individuals. But the numbers are still very much lower than would be expected for this time of year. It could well be that the extended and intense rains of November resulted in the death of many larvae and pupae. It may take time for those numbers to recover, especially considering the continuing decline seen over the recent two decades. 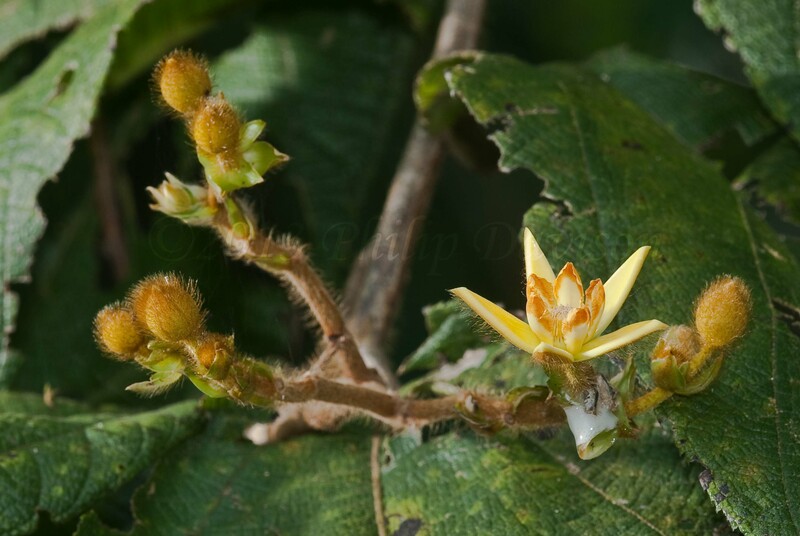 This time of year is usually noteworthy for the trees and other rain forest plants coming into flower. There is some visual evidence of several trees coming into bloom but once again not in the number or variety associated with the onset of the dry season. One other creature notable by its absence at the moment are the cicadas. January is regarded as the start of a three month period when, during the day at least, your eyes are subject to a continual sonic bombardment of an indescribable intensity. The larval stage of the cicada is spent below the ground where they feed on sap from plant roots. It is not beyond the bounds of possibility that many of the larvae were drowned thereby reducing the number of emerging adults which are generally to found in millions this time of year. For many people that aural attack will not be missed but the ramifications on the ecosystem may have long lasting effects. One feature of the transition from the wet into the dry season that is very evident as you walk through the forest at this time of year is the production of new leaf. The feature that makes the new leaf so obvious is the color – red. Cabo Matapalo is on the South West tip of the Osa Peninsula, Costa Rica. The location is only 8⁰ North of the Equator. Any sunlight hitting the earth’s surface at this latitude is therefore intense sunlight and significantly high in ultra violet radiation. Ultra violet radiation damages developing tissue. The plants produce a red pigment called anthocyanin which is deposited over the developing chloroplasts and protects them from irradiation. As the chloroplasts mature the plant reabsorbs the anthocyanin and now lays it down as a layer on the bottom of the leaf surface. Light hitting the forest floor is only 1% of that hitting the canopy so light is of a premium. Light hitting the leaf will pass through and be bounced off the underlying red layer and reflected back up through the leaf surface so that any light required by the plant to carry out photosynthesis it missed on the way down it will pick up on the way back through. Many of the young leaves hang droopily facing down. Those that have no anthocyanin and not having developed much chlorophyll, look pale and ghostly in the in the gloom beneath the canopy. At this point they are flaccid and not until water is absorbed by the cells do they become turgid and assume their horizontal light gathering aspect. One of the butterflies that exhibits very profound seasonal fluctuations is the White Banded Fatima, (Anartia fatima). It is one of the commonest Costa Rica butterflies. It is hard to miss with the white bands on the wings contrasting starkly with the dark brown ground color as it flies in open sunny areas such as gardens and disturbed ground. It can be seen visiting a wide variety of nectar plants. White-banded Fatimas can be found throughout the year in greater or lesser numbers. This week the numbers started to increase very rapidly. In some locations there were dozens of them, all looking fresh and new. But once they reach a peak in numbers and the short-lived reproductive frenzy is over then it will not take long for them to start to take on a tattier appearance and finally within a couple of weeks they will have more or less all gone again. But later in the year the cycle will repeat. As the dry season progresses then the creatures that live on the forest floor take shelter in the moister damp conditions beneath the leaves that litter the ground during the heat of the day. As you walk on the trails and your feet disturb those leaves that disturbance will flush the smaller creatures from their hiding places. You will see displaced skinks, beetles and frogs seeking safe refuge from your footfall and the sunlight. 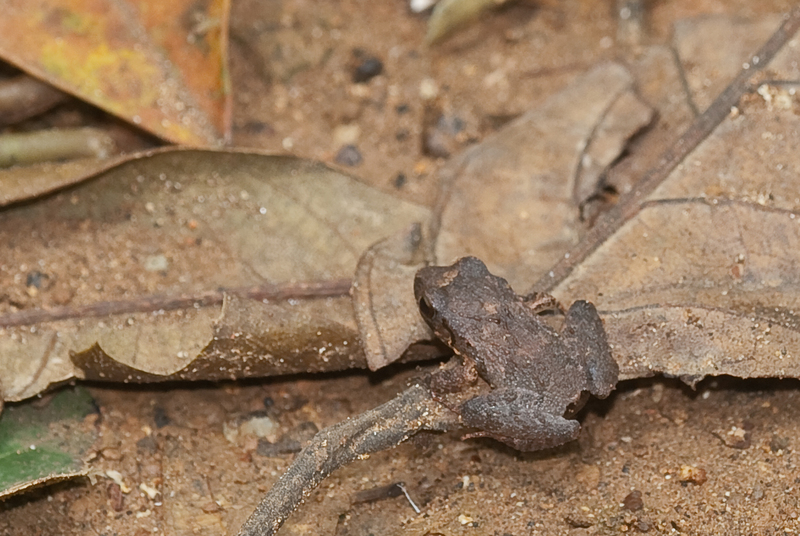 There are several small frogs that inhabit the forest floor. These are the rain frogs mostly in the genus: Craugastoridae. On the forest trails there are two species in particular that you may come across, the Rough-skinned Dirt Frog, (Craugastor rugosus), and Stejneger’s Dirt Frog, (Craugastor stejnegerianus). The Rough-skinned Dirt Frog, as the name suggests, has a skin covered in many protuberances. Stejneger’s Dirt Frog on the other hand has a smoother skin and a generally darker area behind the eye. Both these species have life histories that have allowed them to decrease their dependency on water and become more terrestrial in habit, certainly in respect to reproduction. Whereas most amphibians must return to the water to breed, the rain frogs pair up and lay their eggs amongst the leaf litter on the forest floor. The microclimate beneath the leaves is damper than that above which suits both the frogs and their eggs, it stops them from drying up. Aquatic egg-laying frogs face the problem of having many predators in the water that will feed on the eggs and the tadpoles. Rain frogs do not face the same intense predation pressure and can therefore produce fewer but larger eggs. The larger size of the egg allows full development of the tadpole within a protective gelatinous coating. A larger amount of yolk is provided which supplies enough sustenance for the frog to complete development and emerge four or five weeks later as a tiny copy of the adult. Stejneger’s Dirt Frog – One too many flashes and It’s Away. 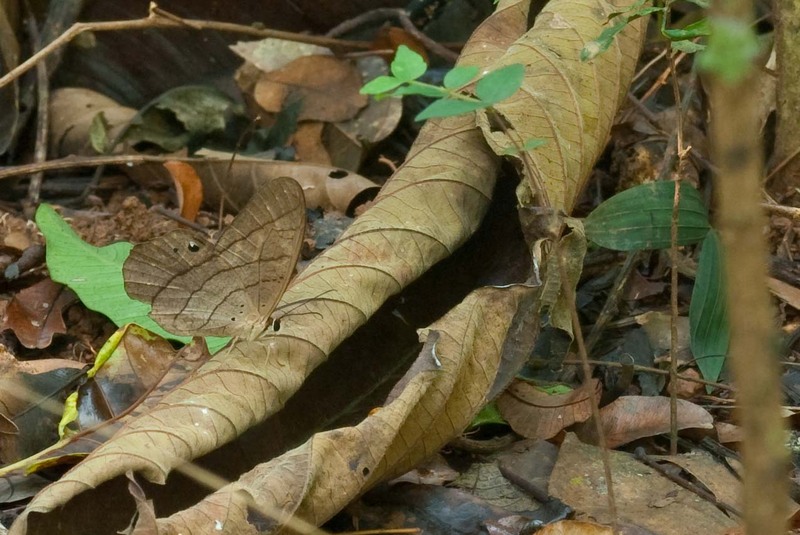 Moments after photographing Stejnegers’ Dirt Frog I noticed a tiny black speck of a leaf which moved in a very distinctive and familiar fashion. The almost indiscernible black dot was a jumping spider. It had turned to look at me which is how it gave away its presence. I had to turn the camera lens on it and take same photographs to truly appreciate the amazing little creature I had in front of me. Jumping spiders belong to the most diverse spider family: Salticidae of which there are more than 5,000 named species around the world. In Costa Rica there is not a wealth of reference material you can consult in an effort to make an identification. Sometimes family level is about as far as you can go. The most distinctive feature of the jumping spiders is the large anterior forward facing eyes. These give the spider the ability to see things at close range. They can be seen orientating themselves to watch you. That is what this one was doing with me. Unlike their web-building relatives, the jumping spiders hunt their prey down. Once they identify a potential meal they will pursue it and at the last moment pounce on it, deliver the venomous bite and consume it. Their visual abilities allow them to use coloration as a cue in mating. The males may have brightly colored legs and pedipalps to court the females. This species had bright blue legs and yellow pedipalps. When a male sees a female he performs a series a ritual dance moves which include lifting his legs in a certain sequence as well as moving in a series of set maneuvers in front of her. All the while the female is watching, scrutinizing the performance. One blunder and she will leave having no further interest. Each species of jumping spider has a very specific dance routine thereby negating the change of courting the wrong type of girl. Unidentified Jumping Spider. Look at Those Eyes. One of the most distinctive flowers of the forest understory is that of the Aristolochia vines otherwise known as the Dutchman’s Pipe Vine. As with most flowers the sole purpose is the achieve reproduction through pollination. Many plants have evolved ingenious means by which to use the flowers as a means to this end. The Dutchman’s Pipe is one of them. The flowers are named after their resemble to the carved tobacco smoking pipes used in Holland. But to a carrion fly they look somewhat different. Carrion flies are attracted to the fetid odor of rotting flesh. The flowers of this species of Dutchman’s Pipe, (Aristolochia gaudotii). give off a scent which mimics the stench of a putrefying body. The pale yellow base color reticulated with maroon blotches visually emphasize the illusion. 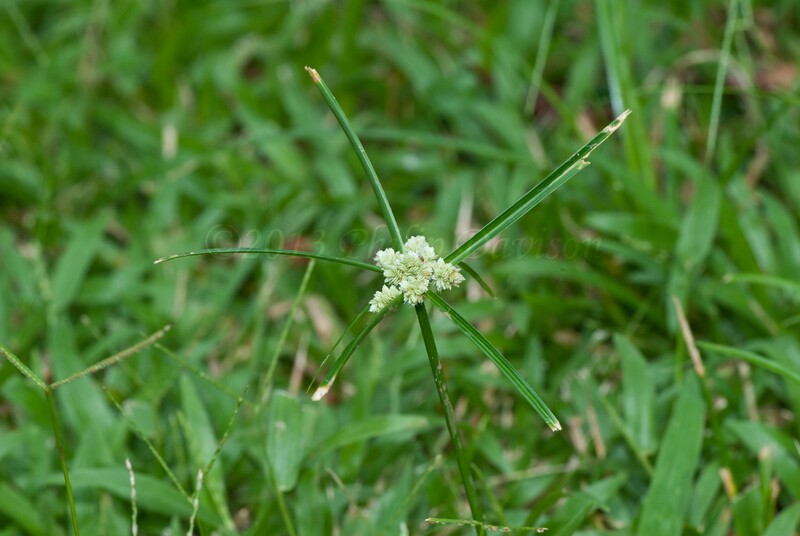 The flies land but find themselves incapable of maintaining a footing on the slippery oily inner surface of the flower and slip down into the interior. They are unable to make an immediate escape as their exit is blocked by a barrage of downward pointing stiff hairs. They are trapped. During the period of vegetative incarceration, the fly struggles violently in order to gain its freedom. This results in the body becoming covered in pollen. The following day the stiff hairs wither and the fly finds its exit clear only to fly off and respond to the same trickery. This time it transfers the pollen thereby pollinating the flower after which it will be released from its temporary floral prison with a fresh coating of pollen. Dutchman’s Pipe. Looking Down Through the Prison Bars. Tagged with Anthocyanin, Jumping Spider, Rough-skinned Dirt Frog, Salticidae., Stejneger's Dirt Frog, White-banded Fatima. It could well be the the transition is occurring. This week began with a little rain and eventually that became less and less. The sun was shining most days and with clear blue skies to make sure the butterflies were active. This week I have instigated the butterfly and amphibian counts again. The project that I had been collecting data for over many years needs finishing. Many years ago I started monitoring the dynamics of both butterfly and amphibian populations. These were being measured against temperature and precipitation figures respectively to try and evaluate as to whether the climate of the area might be changing and if it is what affect that may have on the flora and fauna of a tropical season forest such as exists at Bosque del Cabo. There have been several exciting sightings at Bosque del Cabo this week. While conducting my butterfly counts I found a Baird’s Tapir, (Tapirus bairdii), print in the soft earth near where the trail exits onto the main driveway. The print was very obvious due to its large size and distinctive three leaf shaped toes. The tapir is an odd-toed ungulate an order of mammals, (Perissodactyla), that also includes horses and rhinoceroses. There have been several records of tapirs passing through the bosque property over the years but as to where they came from or where they were going is currently unknown. 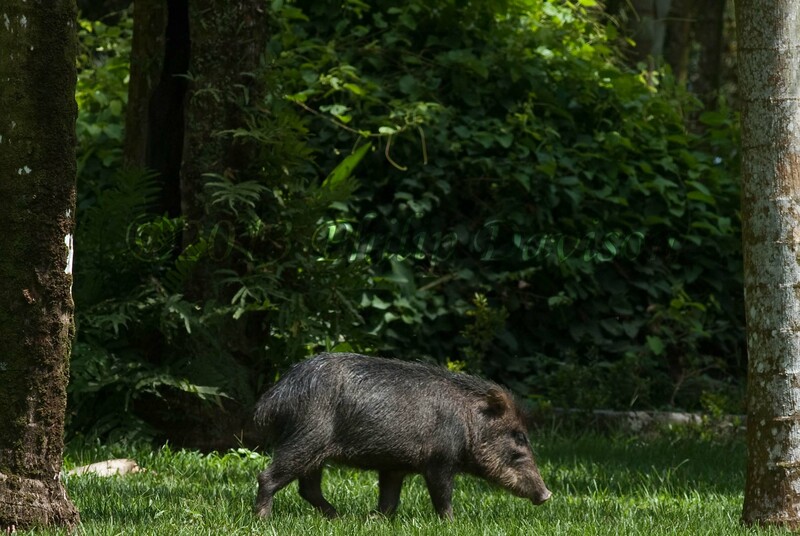 If you have been following the blog you will be aware of the fact that some months ago a small herd of White-lipped Peccaries, (Tayassu pecari), appeared in the grounds of Bosque del Cabo. Every day they would do their rounds passing in front of the restaurant just after lunch before making their way through the mango orchard. They could also be seen and most smelled out on the trails in close proximity to the lodge. Progressively though the numbers dwindled. As with the tapir we are not sure how they made it here but we were certainly glad to see them as they are normally an indicator of more pristine forest conditions. Now there are two, a male and a female, who have taking a liking to the garden area in front of the restaurant. Every day they are seen feasting on the fallen fruits of the palm trees, a variety of species which are producing small red fruits at the moment. If approached he loudly clacks his teeth, his long shaggy hair stands on end and he runs off grunting in irritated disapproval of being disturbed. The female is a little more relaxed and tolerates close approaches before trotting off a short way before commencing feeding. This is one of those enigmatic animals that people hike for days through Corcovado National Park with a vain hope of seeing, along with the tapir. Here they are in the grounds of Bosque del Cabo Rainforest Lodge for all to see while eating their breakfast. The reason that Bosque has acquired the reputation as the wildlife capital of Costa Rica is that the 800 acres of grounds has a huge selection of habitats within which reside a phenomenal amount of biodiversity that is not too difficult to experience. This week a three of our guests, Courtney, Che and Jermaine arrived from Texas and Los Angeles. The first question they asked was “where can we see a Puma”. I related a tale of a wildlife photographer who had photographed a Puma on the steps of the cabin in which they were staying. That particular scenario was unlikely to repeat itself. But the next day just after breakfast one of the Che was walking across the lawn and came face to face with a beautiful female Puma that was walking between cabins Congo and Mariposa. He returned to the lodge to inform the other two guys who immediately headed over to the area where the cat had been seen, cameras in hand. 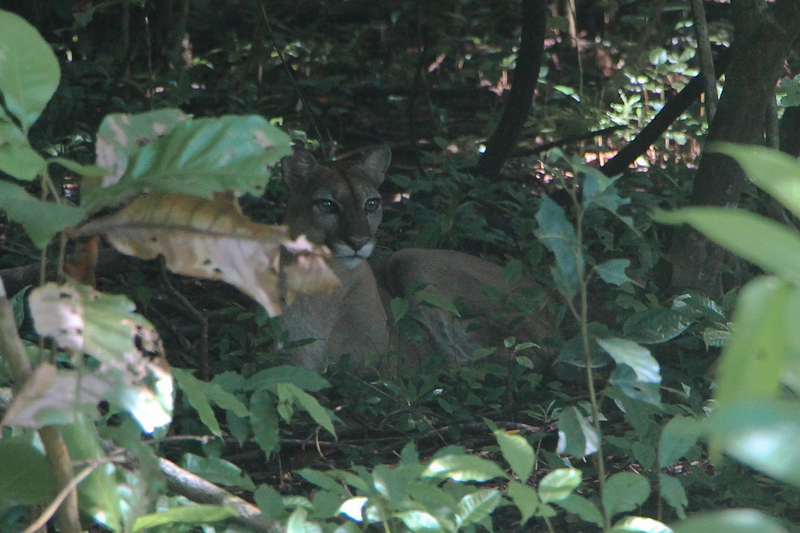 There was the Puma lying in the shade, completely indifferent to the presence of those trying to capture its image. Many thanks to Courtney Bennett for allowing us to use the photo. There are several species of anolis lizards to be seen around the grounds of Bosque del Cabo. Some are literally everywhere, in the buildings, in the gardens and in the forest. 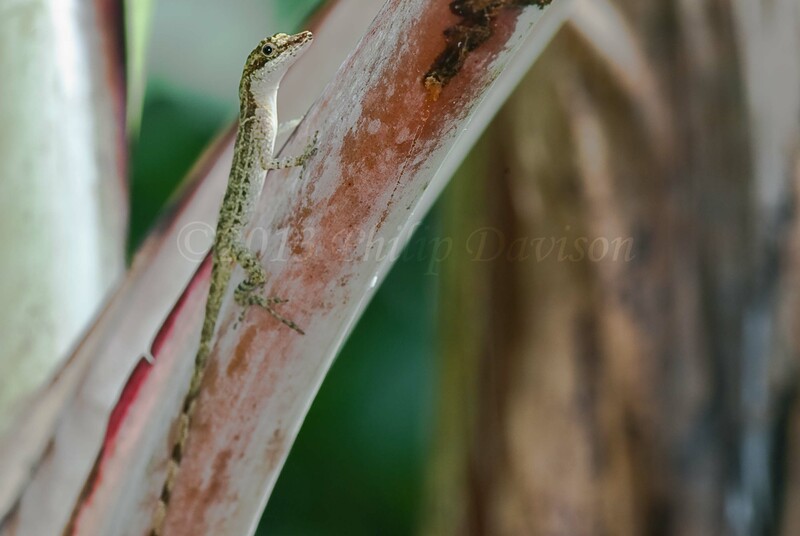 The most common is the Golfo Dulce Anolis, (Norops polylepis) which is small but quite often noticed due to the males extending the bright orange flap of skin under the chin which is known as the dewlap. A slightly smaller anolis is the Common Anolis, (Norops limifrons). It may be a delicate looking lizard but nonetheless is very robust in defending its territory. The males of this species have a small snow white dewlap. If a rival male enters its territory it will bob its head up and down furiously and then chase the potential invader away. While the forest trails remain damp then some of the amphibian species can be seen during the day. The Black and Green Poison Arrow Frogs can still be found in numbers on the trails by the restaurant. On some of the longer forest trails if you watch down by your feet you will see tiny frogs of which there are several species. These are the dirt frogs. There are two commonly found species, Stejneger’s Dirt Frog, (Craugastor stejnegerianus) and the Rough-skinned Dirt Frog, (Craugastor rugosus). The dirt frogs and the related rain frogs are totally terrestrial frogs, they don’t return to the water to reproduce. The male and female pair up, the female lays around 10-30 large yolk-filled eggs which the male fertilizes. The whole process of development takes place within the egg so there is no free-swimming tadpole stage. After 7 or 8 weeks a tiny copy of the adult emerges from the egg. The clouds of Green Urania Moths continue to increase in number on a daily basis. Wherever you walk numbers beyond counting take to the air. At eye level the metallic green bars on the velvet black wings glint and shimmer as they fly from shade to sunlight and back again. Look up above your head into the sky at tree level and you will see endless black silhouettes lazily drifting to and fro. The continuous sunshine is bringing more and more butterflies out. The brightly colored Heliconiids or longwing butterflies gaudily dressed in contrasting primary colors of red, orange and yellow can be seen rapidly fluttering from flower to flower. The shocking electric blue of the Morphos easily catches the eye as they drift down forest rides and stream beds. In the adult stage the morphos feeding on fallen and fermenting fruit. 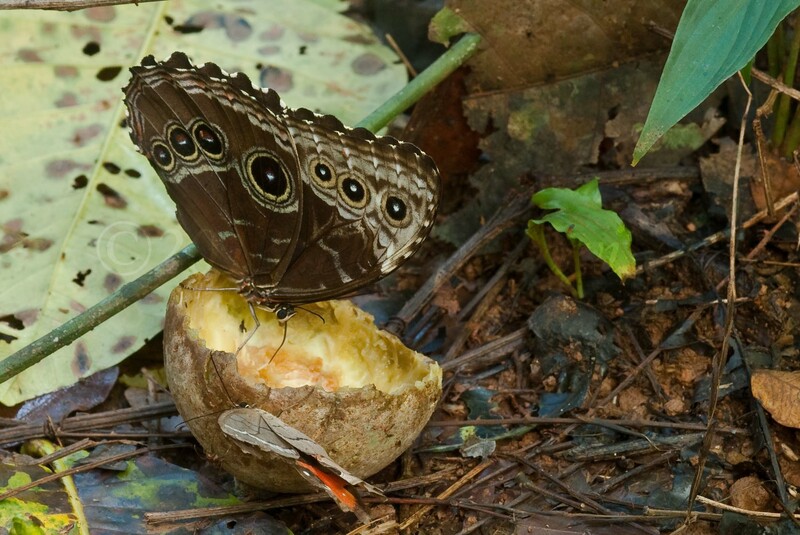 If you should find, for example, a lot of figs that have dropped from the tree tops and are covering the ground, you will invariably find several individuals of Morpho menelaus and Morpho helenor imbibing the liquid fruit cocktail. If they scatter upon your approach they will merely circle and alight again in the same position. The morphos aren’t the only butterfly to indulge in this sylvian liquor. Some of the satyrs will join them. The satyrs are normally brown butterflies with wing patterns that create the illusion of dead leaves. To this effect they fly close to the forest floor which means when they land their image is absorbed into the background and they essentially disappear from in front of the eye. Two species seen seasonally throughout the year are Pierella luna and Pierella helvina. This year I have decided to take up the data collection again regarding the project I had started some years ago. For many years I had been monitoring butterfly and amphibian populations and trying to correlate dynamic changes in their abundance against the prevailing weather conditions in an attempt to evaluate if there is a recordable change in the climate how is it affecting the flora and fauna of a tropical lowland seasonal forest. I started up the counts again last week. The butterfly count takes place every Wednesday along the course of a 5 kilometer transect which is divided up into 15 habitat sub zones and is conducted once in the morning and again in the afternoon. After observing and identifying butterflies for so long I know when I am seeing a species I have not previously recorded. So it was last week. A small brown object flitted from up in front of me and landed on the underside of a leaf of a low growing plant. It would, of course, be in the muddiest part of the trail. I sank to my knees in a in puddle of brown gooey mud and tried to lower the camera to a point where I could see the specimen which fortunately was sitting still. I took a shot to get the all important image then slowly eased the tripod forward, shuffling along on my knees. I progressively managed to get closer and closer each time clicking the shutter. Due to the low aspect, dark conditions and shooting up into the light the best of the images wasn’t that brilliant but at least it gave me something to work with. The butterfly could be recognized as a skipper which in themselves can be notoriously difficult to identify. The Family is Hesperidae and this was a spreadwing skipper of the Subfamily: Pyrginae. Now comes the difficult part, genus and species. Not having the butterfly in my hand I have to rely on photographic comparisons in reference books. 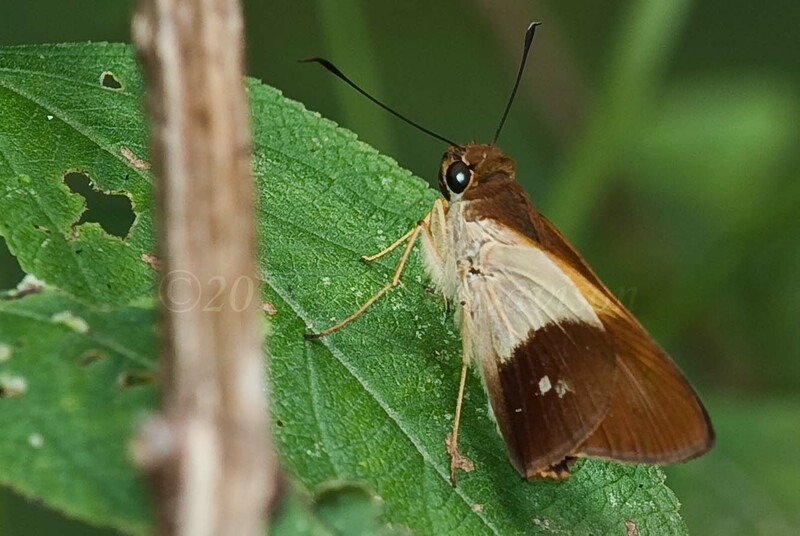 There are lots of skippers and so many of them look the same with only minute differences in coloration or markings. Eventually I settled on the identity of this one being the Least Scarlet-eye, (Nascus paulliniae). That is another new record for the lodge. Another skipper that turned up amongst the more brightly colored butterflies at the Lantana was a Perching Saliana, (Saliana esperi). These are small delicate looking butterflies with handsome two-tone wings. 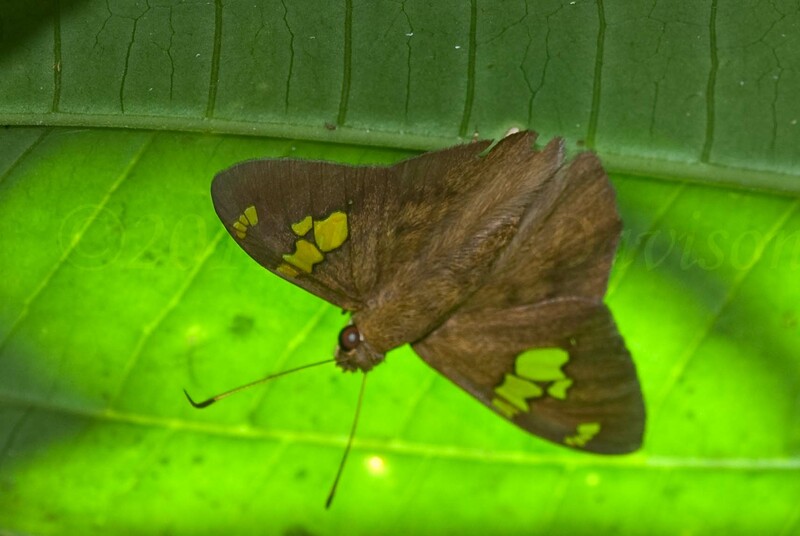 The leading front half of the underside of the hindwing has a rich cream color with a diffuse curved border blending into the soft warm brown of the trailing half. Every day I while walking around the trials or the gardens I make notes of everything I see and hear which leads to the production of the species lists below. These are all casual observations, there is no scientific methodology as there is with the above project. You tend to encounter the larger, louder, brighter and more obvious species more than those that don’t advertise themselves as readily. To that end I went out to photograph some of the plants that we have around the grounds that most people would walk by and not even notice. When it is fruiting the Monkey-comb Tree, (Apeiba tibourbou) produces the very distinctive spiny globular fruits that many people make comment upon when they find them on the forest floor. This time of year all you will find are the old spineless shells. But you know the new fruits will soon be appearing as the trees are bearing flowers. The petals are a bright yellow with very hairy sepals. 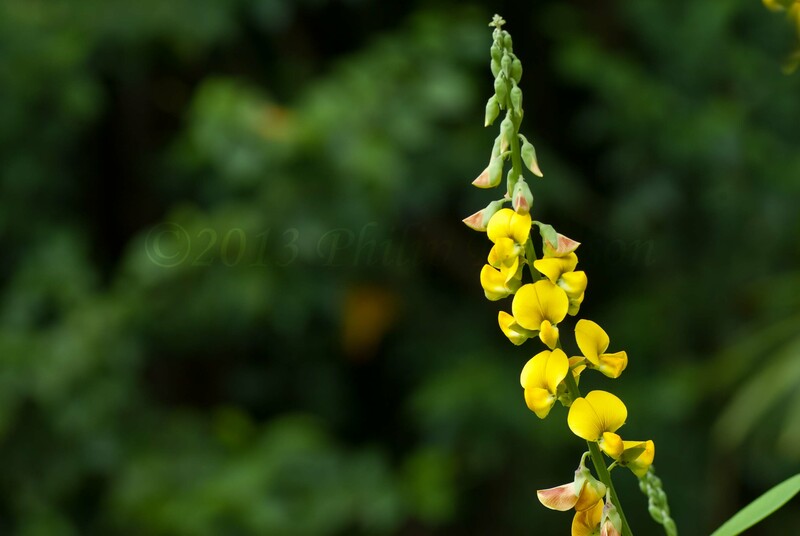 Another yellow flower is that borne by the Gallinita, (Crotalaria retusa). 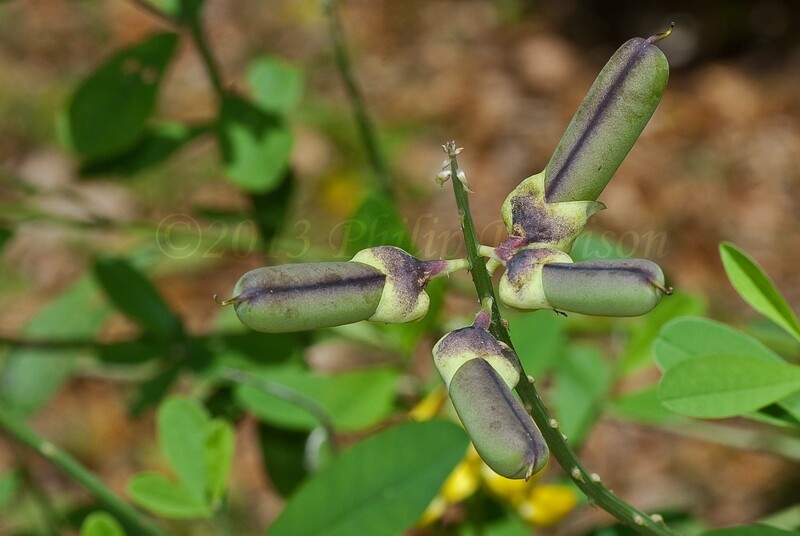 It is very reminiscent of the Lupins found in English country gardens and in fact belongs to the same family: Fabaceae. 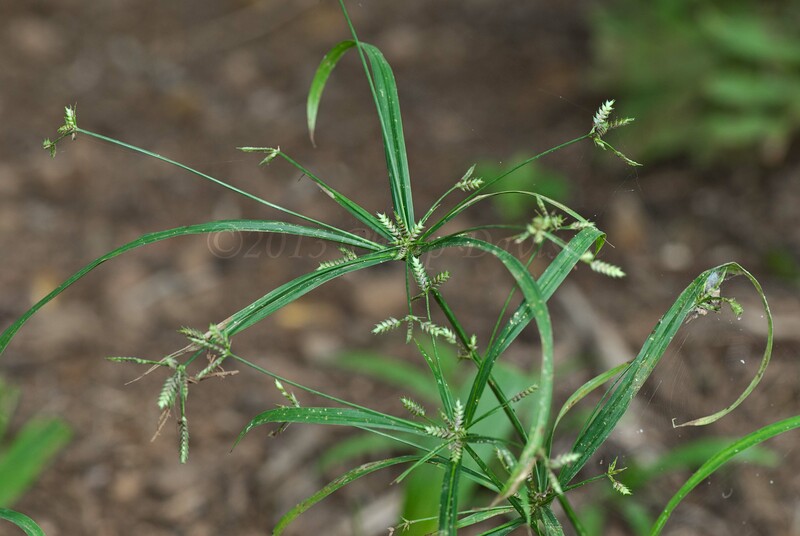 This is normally a plant you would find in open sunny situations. The pods look like small fat peapods. There are several purple flowered plants in bloom around the grounds at the minute. Brunfelsia grandiflora is a small shrubby bush native to South America that is planted in gardens throughout Costa Rica. When they open the flowers are at first purple but these then fade and eventually end up as white. It flowers all year long which is why it is a garden favorite. Finally there are the sedges and grasses which are very difficult to identify to species level unless you can find a good key. 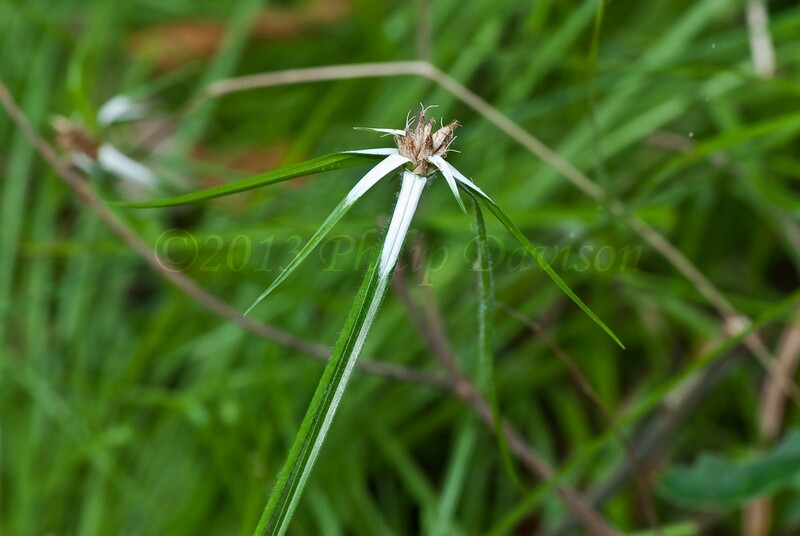 The only one that I photographed that was easy happened to be a sedge with distinct white bases to the bracts which give it the name Little Star, (Rhynchospora nervosa). Philip is a biologist, writer and photographer at Bosque del Cabo Rainforest lodge on the Osa Peninsula, Costa Rica. Highest Daily Temp 92°F. Lowest Daily Temp 74°F. Highest Daily Temp 33.3°C. Lowest Daily Temp 23.1°C.